After Treading through a plethora of blush pink and ivory rose petals to say their "I dos", Karen, Silvano and guests gathered at the very resonant and modern La Primavera in Woodbridge to celebrate their union. The ice blue and metalic silver atmosphere created a lively and refreshing contrast against the vibrant ivory, pink, and green floral arrangements nestled in high glass "Paris" vase centerpieces at the guest tables. The sheer ivory backdrop with silver rosette and crystal panels was breathtaking but also perfect to compliment the head and cake tables dressed in a custom designed Silver Versace linen with pearl beading. Silver crinkle linens with ice blue, crystal pinched runners trailing over top of them made up the bridal party tables which emanated a very refined yet elegant ambiance. Karen and Silvano-we wish you all the love and happiness that life has to offer! Thank you for letting us help you make your vision come to life. Anthony and Eliane walked down a blooming red isle runner and said their vows under a sheer white chuppah accented with stunning red roses at the eloquent Chateau St. Antoine in Quebec. The intricate array of champagnes, reds, and ivories all came together beautifully yet looked effortless. Anthony and Eliane's wedding was surrounded by a plethora of red roses symbolizing love, honor, and faith- the very essence of their union. We sincerely wish you all the best! 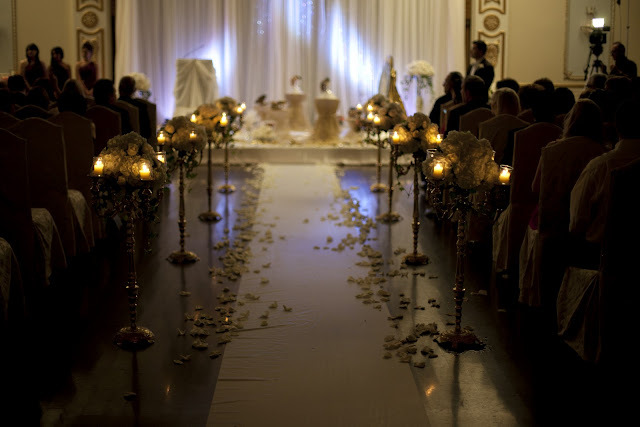 Ali and Bahareh walked down an aisle surrounded stunning gold ornate Candelabras at the regal Venetian Banquet Hall. They exchanged rings amidst a sea of ivory rose petals as family and friends witnessed a fairytale love come to life. With a gold and white colored reception, the bride and groom's royal and majestic visions came to life with a head table dressed in a Champagne Victoria Secret Linen, a sheer ivory backdrop with dangling crystals, gold overlay cocktail tables, white hydrangea flowers nestled in a vintage gold candelabra centerpiece, with even fruit made of gold- Ali and Bahareh's wedding was fit for the gods! Ali and Bahareh, we wish you all the happiness marriage has to offer!